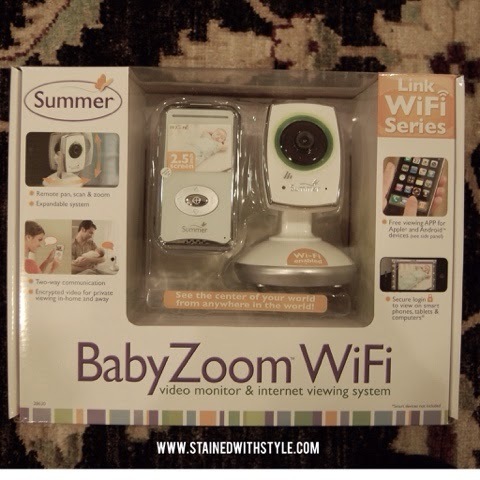 My Baby Monitor Woes have a Solution! I have had a zillion baby monitors. Ok, maybe not a ZILLION, but we have bought a lot of them. I can honestly say I have tried about every kind out there and I am in love. Our first monitor was the most highly rated sound only monitor. Because parents who have access to video monitoring will totally use a sound only monitor for their first baby. Right. THAT didn't last long. The next one we bought was a camera that expanded to two when we had R3. The picture quality wasn't that great, but it was secure. I, and the hubs were concerned about someone hacking into our camera. The problem was that it pretty quickly broke. Huge bummer and a huge expense to replace it. Our next purchase was, wait for it...a closed circuit monitoring system. I kid you not. One of those big, black camera systems. Super ugly, but the monitor is as big as my iPad. I can see every hiccup and sigh. I love that. Plus the cameras weren't that expensive when we transitioned to three. Yes, three cameras. I had three babies, three years and under. I needed ALL of the cameras. The big problem is that it is super ugly and obviously not something we can travel with. This monitor solves a lot of my problems. It was very simple to set up and I DIDNT EVEN ASK THE HUBS FOR HELP. I should repeat that. It is definitely a first in this house. He does all of my tech for a reason. It was easy peasy. I charged the unit, plugged it in, followed the directions and it worked. I get the Trivial Persuit Genius Edition prize today! I even was able to hook it up to my phone. That's right folks, you can access it remotely from an Android app (which I appreciate very much), an Apple App or a desktop. We are SO excited about these features. First, the hubs was able to log on from work and watch the kids play during the day. It was so much fun for all of us, but I quickly realized I do NOT want the man watching me. (Just kidding babe.). This is fantastic not only for when we have a sitter but because of its portability. Yes, it comes with hardware to bolt it to the wall, but it is small enough to travel with. That means we can bring it with us and see the kids if we leave them at a cousins house. My nerdy heart is beating fast. This camera retails for almost $200, but you can find it on Amazon for much less. As it is an expandable system (up to two), you can also buy additional cameras. I received product for the purposes of review but was not otherwise compensated.